Emory shows its appreciation for staff members on Friday with a festival on the Quad featuring music, dancing, food, games, giveaways, a volleyball tournament and the Fun Run-Walk. Staff Fest, Emory's annual employee appreciation event, fills the Quad on Friday with games, food, giveaways and friendly competition. Kiyana Perrino, a research administration coordinator with the Rollins School of Public Health, came up with the winning theme through a contest sponsored by the Emory Employee Council. “Reflecting on how Emory is such an innovative, resourceful and well-known institution inspired me to come up with the theme,” says Perrino, who began her research career at Emory in October 2013. She was pleasantly surprised at winning on her first time entering the contest. The winner receives a $25 gift card from Emory’s Barnes & Noble Bookstore and a free Staff Fest T-shirt featuring her winning theme. What message does she hope the theme will send? “I would hope that people take away how Emory has such a positive and powerful impact throughout the world that will continue for years to come,” she says. The T-shirt designed to illustrate Perrino's winning theme also provides Staff Fest with a way to honor Emory President James Wagner, who will be attending his last Staff Fest before retiring in August. The president attends every year, making brief remarks thanking the staff for their work over the past year, then enjoying the activities on the Quad and talking with attendees with his wife, Debbie. 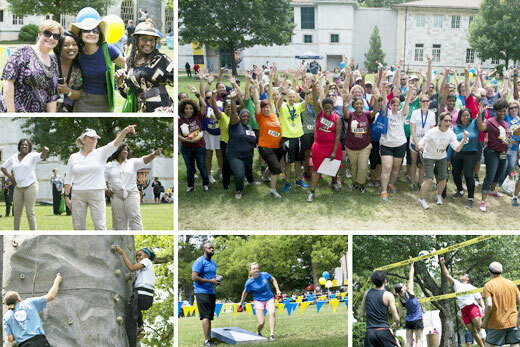 Staff Fest events begin at 11 a.m. with the Fun Run-Walk and the volleyball tournament. The two-mile run/walk starts at Asbury Circle. The route winds through the campus and ends on the Quad, where other Staff Fest activities take place. Prizes will be awarded in several age groups for men and women; additional prizes for other categories will also be awarded. The volleyball tournament features refereed games on the Quad from 11 a.m. until 2:30 p.m. Teams registered in advance to participate. The main Staff Fest activities begin at noon. They include music with a DJ, dancing, a rock climbing wall, green screen photos, lawn games and caricature artists. Emory Information Central is also back this year with tables featuring information about Emory divisions and services, plus numerous giveaways, says Manning. While Staff Fest does not provide a full lunch, there will be light refreshments including beef, turkey and vegan hot dogs; chips, ice cream, popcorn and Coca-Cola products. In the event of rain, the Staff Fest celebration will move to the Dobbs University Center’s Lower Level Terrace for refreshments only.